Weeks After Hurricane Maria, Puerto Rico Struggles To Turn On The Lights Nearly 90 percent of Puerto Rico is still without power more than two weeks after Hurricane Maria. Authorities say it will take months to restore electricity, as the storm destroyed the power grid. A man rests in a hammock, using a battery-operated light, in an area of San Isidro without electricity more than two weeks after Hurricane Maria hit the island of Puerto Rico. In a news conference on Friday, Puerto Rican Gov. 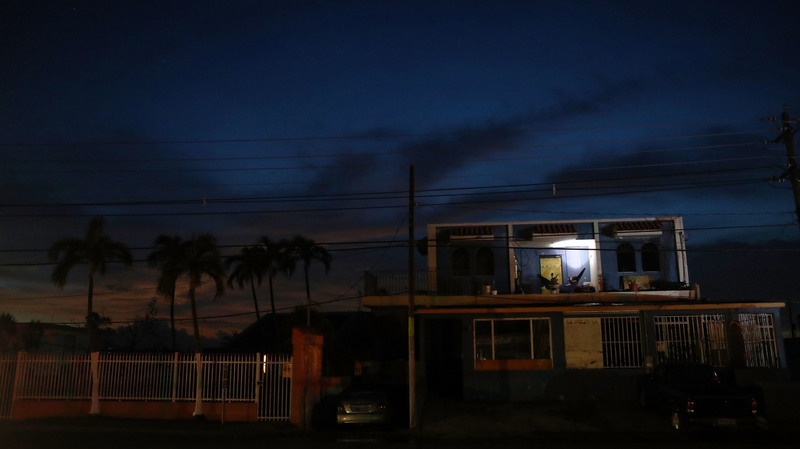 Ricardo Rosselló could not say when the power grid would be fully up and running. "There is no estimated date right now," he said. "We have established, right at the beginning of this week, we want to have 10 percent of the energy generation in Puerto Rico. Now we're up to 10.6 percent. And our expectation is, within the next month, to have 25 percent." It will cost an estimated $5 billion to repair the island's electricity transmission and distribution system, which was almost completely decimated by the storm. Román, president of the energy commission, tells Here & Now's Jeremy Hobson the system suffered such a catastrophic failure because PREPA was so deeply in debt that it was unable to finance upgrades to its generating plants. Power lines were also left more vulnerable to tree branches, other debris and strong winds. The government-owned utility filed for bankruptcy in July in an effort to restructure its $9 billion debt. Puerto Rico itself filed for bankruptcy a few months earlier and began working with Congress to restructure debt that exceeds $120 billion. The U.S. territory has struggled for years with an ever mounting debt crisis. Román explains that once Puerto Rico's economy started to suffer, the power authority began issuing bonds to function. "PREPA started issuing bonds to either finance capital improvements, and in some cases, might have financed operational costs," Román says. "In 2014, when PREPA's credit was downgraded, then PREPA didn't have any more access to the capital markets at a reasonable price." President Trump has faced criticism for his administration's slow efforts to provide help to the island. When he arrived in Puerto Rico last Tuesday, Trump touted the relief effort, seeming to joke about how much the recovery was costing the U.S.
"Now I hate to tell you, Puerto Rico, but you've thrown our budget a little out of whack," Trump said, "because we've spent a lot of money on Puerto Rico, and that's fine. We've saved a lot of lives." The Washington Post reported last week that metrics displaying the number of Puerto Ricans without power and clean drinking water were removed from FEMA's website. A FEMA spokesman said the statistics were still available on a website maintained by the office of Puerto Rico's governor, but he would not elaborate on why they were no longer available on the FEMA site. As of Friday afternoon, the percentage of the island that has power and the percentage of Puerto Ricans with access to clean drinking water were returned to the FEMA page. Despite the maligned federal response, some states are stepping in to help the battered U.S. territory. New York Gov. Andrew Cuomo sent a team from the New York Power Authority to assess the situation and help reconstruct the power grid. "We saw a lot of damage, mostly on the transmission and distribution system," says Gil Quiniones, president and CEO of the New York Power Authority. "And you know, it's really more stark when you see it in person rather than through TV or cable." There are still a lot of power lines down, Quiniones tells Hobson. During the team's visit to San Juan, sections of Puerto Rico's capital were "completely flooded," which means the island's grid would have faced similar devastation if the power lines were underground, he says. Business magnate Elon Musk tweeted on Friday that his company, Tesla, could reconstruct the island's power grid with its solar energy technology. Rosselló told USA Today that he spoke with Musk regarding this offer on Friday night. Best known for electric cars, Tesla also includes SolarCity, a solar panel firm that has powered small islands, such as Ta'u in American Samoa. The solar grid in Ta'u can power the entire island and store enough energy for three days without sun. Short of solar technology, Quiniones says his team's work after Superstorm Sandy revealed a number of options to strengthen the power grid, such as strengthening existing utility poles and putting certain parts of the circuit underground. "Things we did here in New York post-Sandy, those things should be considered in Puerto Rico."